Today is only Wednesday and it has already been one of the longest weeks I’ve ever experienced. The best therapy is for me to just rant about subject matter that I feel I know best: the world of sports. Beware here comes a slew of unorganized thoughts better classified as Mumbles. *Chris Paul will be traded before Christmas 2011. New Orleans does not want to go through the “Melodrama” the Nuggets went through last year. With all the leaks about the Celtics wanting Paul, it would be in their best interest to acquire the best point guard in the league by any means necessary. 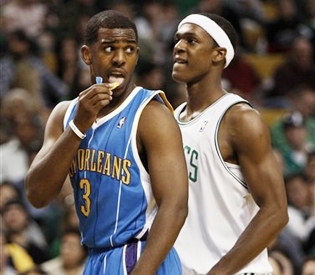 The Celtics current point guard Rajon Rondo is very talented but is beyond emotionally fragile. He broke down last year when his BFF Kendrick Perkins was traded. He broke down when he was “dissed” by President Obama. Now the Celtics are reportedly (by every media outlet) pursuing Paul. If the Celtics fail at acquiring Paul, they will be in for a very long and very uncomfortable season with Rondo running the show. Get Paul now, worry about his contract status later. Ellsbury, Crawford, Pedroia, Gonzalez, HRamirez, Youkilis, Ortiz, Saltalamacchia, Kalish/Reddick. *The Boston Bruins benched Tyler Seguin last night during a 15 game unbeaten streak due to him missing a team breakfast in Winnipeg. Now, I may be in the minority but I love that they benched the 19 year old leading scorer. Nipping any antics that Seguin may be a part of in the bud is essential in his early development. It’s clear to me that his benching has a lot more to it then missing his team breakfast. His excuse will also go down as the worst excuse in sports history. “My clock was set on Boston time and not Winnipeg time.” Tyler may need a geography/time zone lesson to go along with that benching. What we all need to remember is that the kid is 19 and he hasn’t had a chance to experience the night life like we all did in college. I cut him some slack but at the same time applaud the management and coaching decision to discipline him. * I once hated Tim Tebow with a unparraleled passion. I think that was because I was an ignorant Longhorns fan that would hear nothing other than Colt McCoy was the best there was. (In my defense he is the all time winningest quarterback in NCAA history). But after the last two months, how do you not love Tebow? Yes, the whole God squad thing can deter someone but as an athlete? The guy has “it.” Whatever “it” may be Tebow has it. He wins football games and is exciting to watch. Yes, I am all aboard the Tebow wagon! *Unfortunately I don’t have any thoughts on the Patriots. To me they are the most vanilla franchise in Boston sports. It may be a reflection of the coach. They win ball games and move on to the next opponent. Until the playoffs, there is nothing I can really say about them. *I love Ed Cooley. When Providence College first hired him, I was skeptical at best. My hatred of Keno Davis and his thug culture may have angered me to the point I was blind. But there truly was no better person to hire for this position then who they landed. Cooley has demonstrated a willingness to play defense (unthinkable during Keno’s time) and also to discipline players when needed. (Kadeem Batts is yet to play a game. Expected back for the URI game 12-23). I have gone to as many games as I’ve could and have appreciated the development of Bryce Cotton. I like that Vincent Council is playing under control. I like that Cooley has Coleman playing defense. I understand that the Friars may get smoked once the Big East schedule starts. But I expected that coming into the season. But because of Cooley, I now know they will play hard for 40 minutes every night.